Welcome to the 502nd Metamorphosis Monday! Happy weekend to you! I hope you’re having an awesome one! I know it’s not Monday yet, but I have an appointment on Monday so I thought I would go ahead and put this post up now. Before we dive into a mini-project I’m working on in my office, if you’re a Talbots credit card holder, Talbots is having a big sale right now sitewide. (I got this yesterday, so ignore that it says “Tomorrow.”) Basically, anything you buy online at Talbots today is 30% off with the code: CLASSIC30. Update: That sale ended up they just announced a Flash sale, so check that one out! I really like some of the new styles they are getting in for fall, like this beautiful tweed jacket with pearl accents. Sooo pretty and so classic! Tweed jackets always make me think of Chanel. This jacket will never go out of style…which is why I love buying classic styled clothing. You’ll find it available here: Tweed Jacket. I took this photo of my office this morning using a wide-angle lens, I wanted to capture as much of the office, as possible. Unfortunately, wide angle lenses tend to skew the shape/size of a room, making certain views look longer than they really are. For reference, the office is approximately 11-1/2 feet wide and 13 feet deep from the door to the windows. It looks so much longer in this photo, I know. Here’s another photo taken a while back with a normal lens…so this is the normal shape of this room. 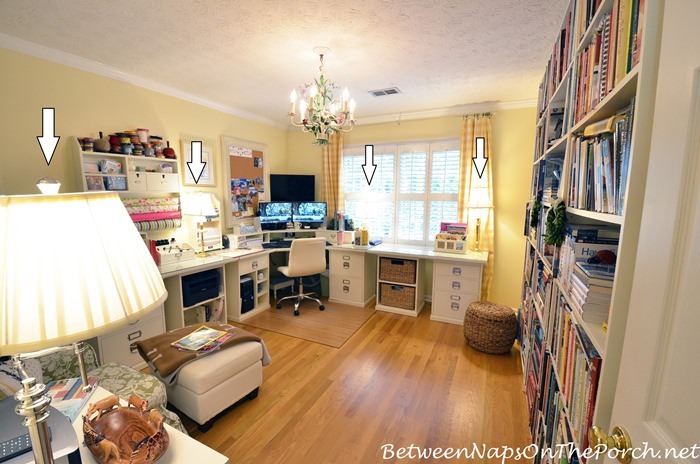 In the photo below, each arrow is highlighting a lamp here in the office. Friends, I’m a lamp fiend! I truly love them! I’ve never been a big fan of overhead lighting, just find it to be rather harsh. Overhead lighting rarely does anything good for the appearance of a room where lamp lighting is easy on the eyes and illuminates a room beautifully. Soft lamp-light can truly transform a room giving it so much warmth and coziness. We’re going to need that very soon with fall and winter coming up. I had the chandelier on in the picture since I wanted the extra light for taking photos. Normally it’s off unless I’m putting something together (like a new office chair) or need it for some other task I’m working on. When furnishing a room, I try to spread lamps out all around the room to give the room full coverage. I just recently added the lamp on the far right of the desk to this room. I don’t know why I never had a lamp there before, but I love how it looks in the evening lighting up that corner of the room. I already had that lamp…stole it from a chest in the Upstairs Living Room. I’ve already found a replacement lamp for the chest, just have to buy a shade for it. I think I’ll work on that this week. In this older photo (sorry about the blurriness) you’ll see two more lamps on the bookcases at the other end of this room. A tall brass lamp is tucked into the corner while a little rooster lamp illuminates one of the shelves. 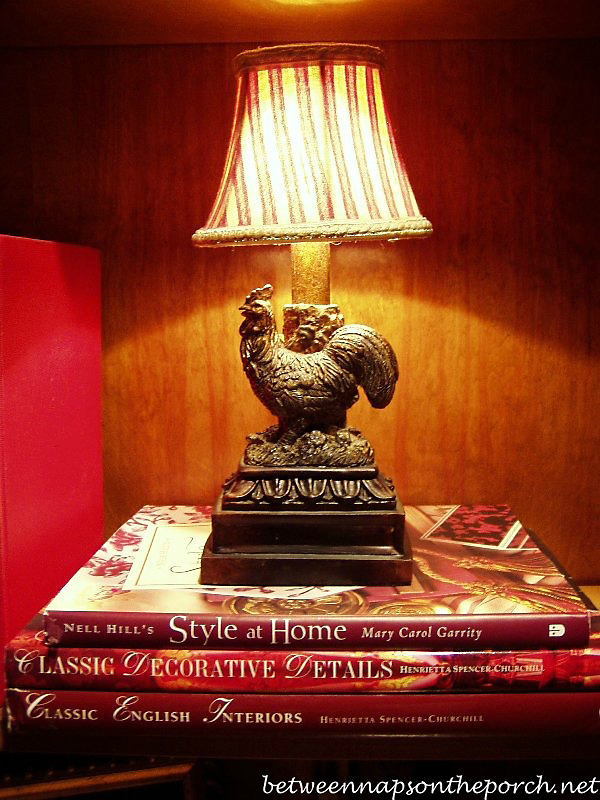 Here’s a little close-up of the rooster lamp tucked onto one of the bookcase shelves. The only place in my office that still lacks light in the evening is this side. I’ve been thinking for some time about adding a little lamp to one of the bookshelves. I even cleared a spot out on a shelf a couple of months ago in anticipation of purchasing a small lamp, but I was never able to find anything I really liked. Small lamps can be really tricky to find! I only have about 11-3/4 height with which to work. Keeping that in mind, I went lamp-shopping online a couple of days ago. 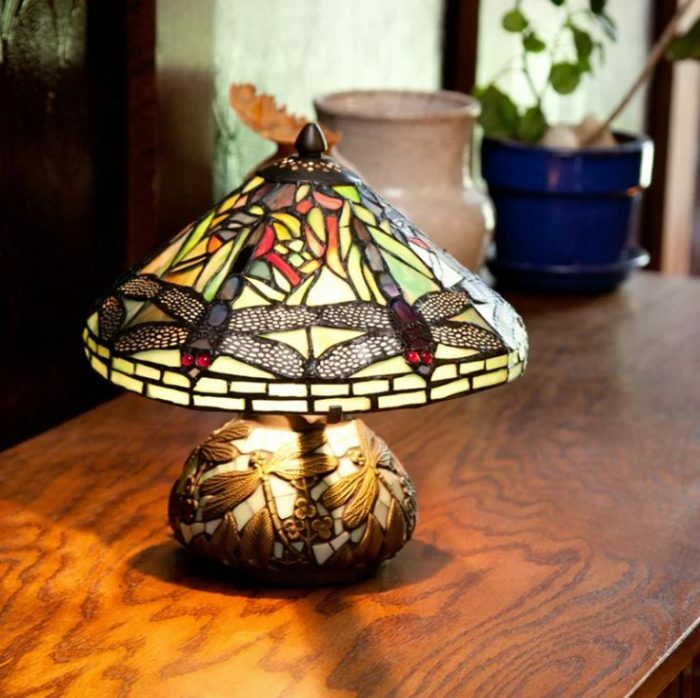 Note: If a lamp below catches your eye, click on the name of the lamp for additional photos and more information. 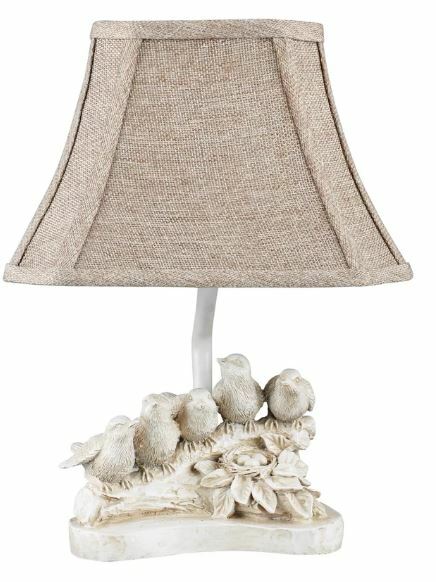 Loved this cute birdie lamp, but it’s about 2 inches too tall for my shelf. I also liked this one a lot, but again, it’s just barely too tall for my shelf. 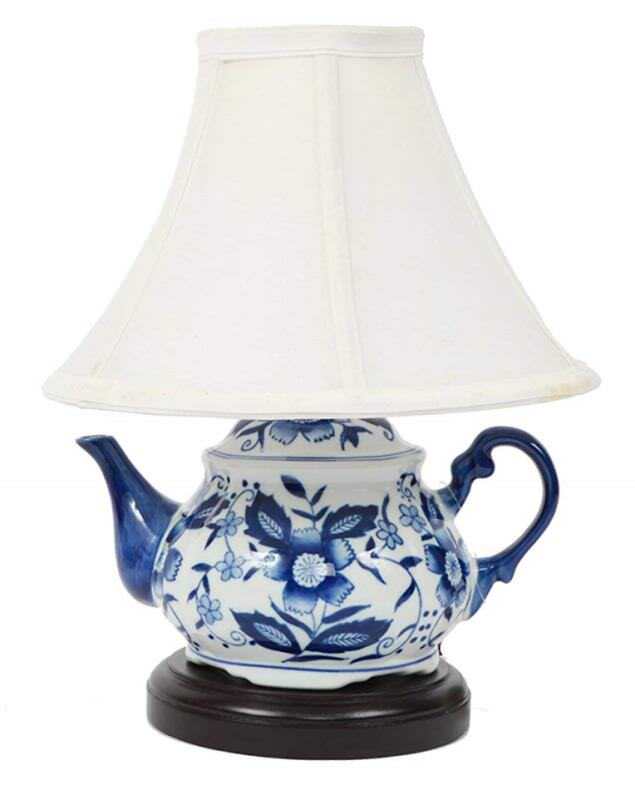 Update: A similar lamp is also available here: Blue and White Teapot Lamp. Then I started noticing all the adorable stained glass lights available. I don’t really need a lamp for task lighting on the shelves, so something decorative would be fine. This light is really cute but probably a bit too small. 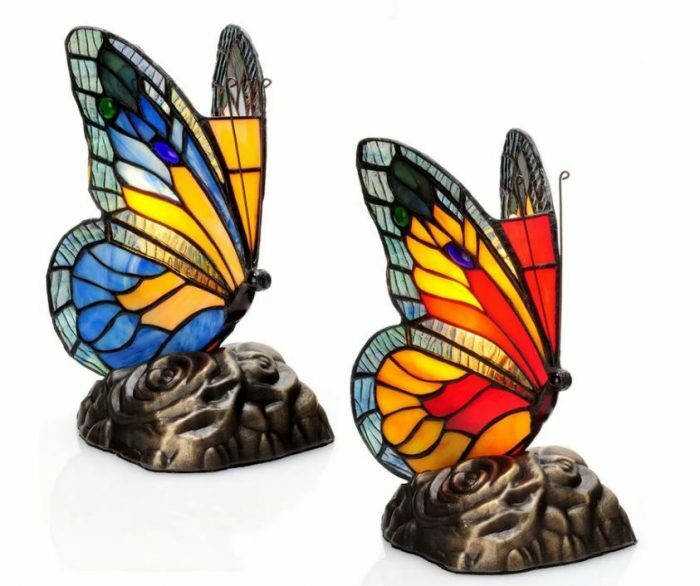 These Butterfly Tiffany-Style Lights turn on with just a touch…love that idea. If you can dream it, someone has probably created it. 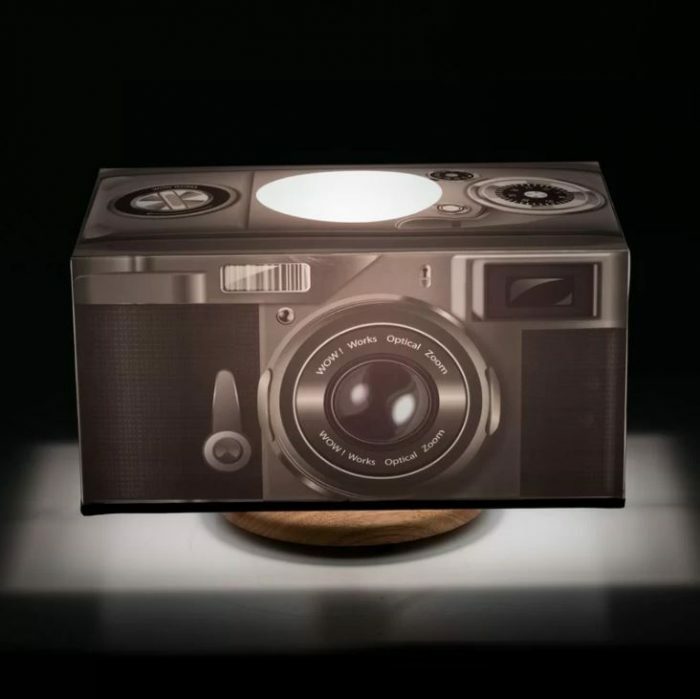 This lamp would be perfect for the photography-camera buff! This lamp is the perfect height for my shelf and I love the dragonfly design on the bottom and on the shade. Sooo cute! Wonder if I can find a spot for it out on the porch. If you need a smallish shelf lamp, you’ll find a ton of small lamps here: Small Lamps. If you only wish to see classic, traditional-style small lamps, go here: Classic Traditional Small Lamps. So what did I choose? Well, I did something kinda weird. lol I started thinking about how I wish there was a lamp designed in the style of a house since the books I keep here in the office are almost all design/decorating books. That made me think about the Dept. 56 lit houses. I have so many of those, but all the ones I have are “Christmas” houses and are decorated with holiday wreaths. Ummm. So then I started Googling for lit houses that didn’t have Christmas decorations on them. I was surprised to come across a collection Dept. 56 created many years ago called, Literary Classics. I had never heard of that series! I noticed none of the houses in that collection were decorated for Christmas like the homes in most of the Dept. 56’s collections, so that was perfect! Out of the homes they made for that collection, the one I liked the best was Aunt Polly’s House from the book, The Adventures of Tom Sawyer. It was so inexpensive, I decided to order one just to see how it would look here in the office. 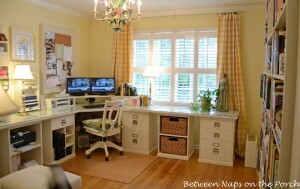 I could just picture this beautiful little house glowing all evening long here in the office. 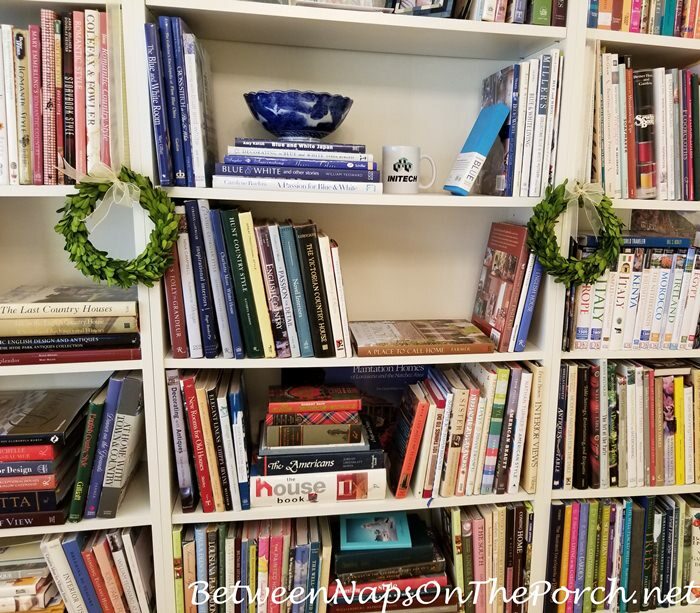 It seemed the perfect little light for my decorating library since it’s both a house–and one that featured prominently in a literary classic. If you would like one of these little houses for your decor library, you’ll find a bunch of them here where I purchased mine: Aunt Polly’s House. I can’t wait until it arrives and I can see it on the shelf. I don’t think it will be too tall. I noticed the book that comes with it is taller than the house, and I know the average size of most Dept. 56 houses, so I think it will be fine, height-wise. This lighting choice was probably a twist that you didn’t see coming! Me, neither! We’ll see how it works out, once it arrives. Previous PostA Shark-Themed Table Setting for a Special Boy’s Birthday Party! Oh dear Susan! Literary houses! You have shown me something that I might not be able to resist. 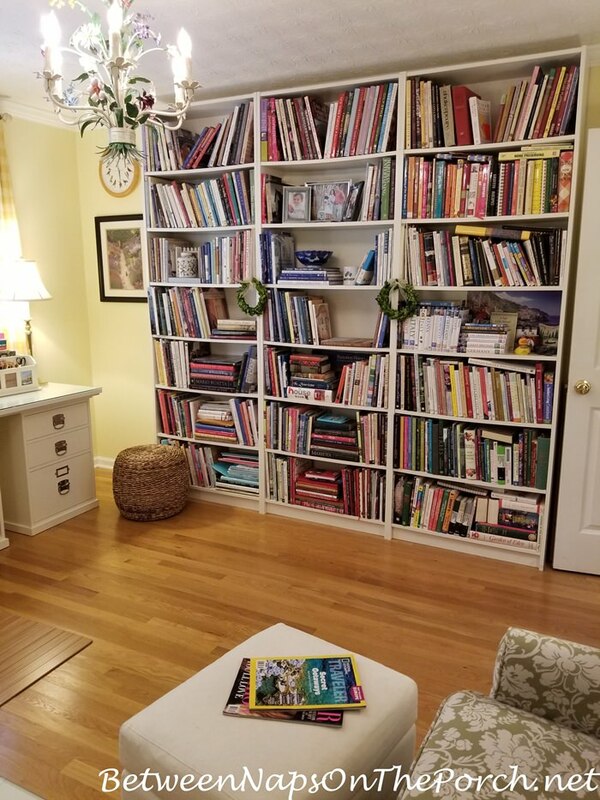 I keep saying I’m going to downsize, but the idea of those little houses on my bookshelves along with my beloved books might be more than I can resist. Those little butterflies are beautiful and rather irresistible too! Great ideas for bookshelf lighting!! I think there are only four in the collection: The Great Gatsby, Little Women, The Adventures of Tom Sawyer and Great Expectations. If I ever finish in the room I want to make into a home library, I will definitely try to collect them all. Can’t you just seem them all lit up on the shelves?! 🙂 I would love that! 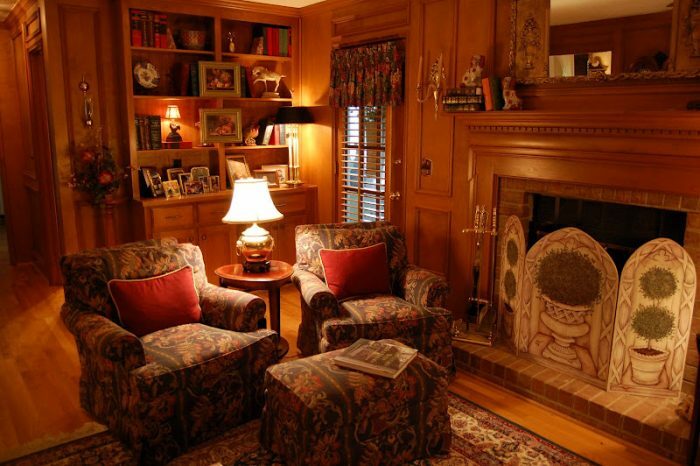 Yes, a library with the entire collection mixed in with beautiful classic books and a cozy chair would be a perfect place to spend a relaxing evening. Thanks for the link to the other houses. I was googling more houses when your reply popped up! I’ll look forward to seeing yours on your shelf. That’s wonderful! I’m hopelessly hooked. Just found Sherlock Holmes Baker Street house including a book on eBay. It said it was part of the Dept. 56 Dickens Village, but I didn’t see any wreaths or Christmas decorations. Even saw a Globe Theater in Dept. 56. Those should have been in the Literary Classics. I always thought Department 56 only made holiday houses. Have fun decorating with the new houses. I’ll look forward to your posts. I thought all the Dickens Village houses had wreaths on them. I have a few downstairs stored in the basement, I should look at them and see. I haven’t gotten those out in ages. That’s awesome about the Sherlock Homes house. I’m going to do a bit more research and see if I can find out how many were created for the Literary Collection. You’re right, the Globe theater would have great for that collection. Lamp-a-saurus because I had so many. I like the way they light a room….very soft and cozy light. I enjoy your blog….thanks for all your interesting posts. lol Guilty, here! Thanks, Tammy! We’ll be Lamp-a-sauruses together. Remember that you can turn almost anything into a lamp – a vase, a sugar bowl – you’re really only limited by your imagination. All you need is an electrician or a lamp kit and a shade! Oh, how I love lamps, too!! My mom always told me that when she was growing up and went to the very elegant homes of her wealthy high school friends the thing that she loved most were the many beautiful lamps in all the rooms and the warm atmosphere they created. Later when she and my Dad created their home she filled it with, you guessed it, LAMPS! And now so have I, in mine! Not only do detest those high hats everyone is obsessed with I can’t understand how people live with them. It’s like being in an operating room and goodness knows that isn’t an experience one wants to recreate at home! Yeah, definitely not the look you want for a living room or family room…or a bedroom. Another thing I don’t like are all the drum shades that they are putting on lamps. They must be super cheap to produce because they are on every lamp you see these days. I end up going to my lamp guy who repairs lamps and buying my shades from him. He orders the most beautiful shades. Thank goodness there are companies out there that are still making beautiful silk shades…you just have to hunt them down. Love this idea!!! How will you get electricity to it??? I too, am obsessed with lamps Susan! Especially small lamps. I have the little birdie lamp in my office, and I love it! I just added a new “sheep” lamp on my sofa table. It has a rectangular shaped shade, with the momma sheep and two babies. The color is similar to the birdie lamp. I’m in South Carolina, and it’s still hot here, but I did put out a few little pumpkins and fall decor today in my house. Can you tell I’m REALLY ready for Fall? Lol! Oh, I love lamps that depict animals, I think those are my favorites! Your’s sound wonderful, Rhonda! I’m gradually starting to get excited. It’s still so warm here, though. I did buy one pumpkin recently that I fell in love with. Looking forward to sharing in a post sometime soon. Love the Literary Classics Series by Dept 56. Did you see “ The Great Gatsby” mansion with convertible, figurines etc?? It’s a gorgeous piece!! I sold mine when I downsized but still have a lot of Christmas lit houses… decided to park car outside as garage is still full of things I couldn’t part with… the angst of downsizing!! I saw that one but didn’t look at it really closely. I bet it’s stunning! It sounds beautiful! I know, I can’t imagine. I’m dreading the day I do that…downsize, rightsize or whatever they are calling it by then. Purchased a new handbag a few weeks ago that had a smaller purse inside with a crossbody strap. Tonight as I was changing purses to the new purse I discovered a surprise that I was not familiar. It had a small charger for a cellphone. The instructions were if you get caught out and your cellphone dies plug it into this charger.The charger is smaller than a cell phone. Have you ever heard of such a thing. The new technology is fascinating. Just wish I understood it all. Love the little houses. My mother’s nickname was Polly. I looked through the houses but evidently that is just the brand name. Is there an Aunt Polly house? I am now on the lookout for a Royal Stewart plaid cylinder tin (cookie i suppose) for the base for a lamp.Haven’t found any tins, one that was too small. May cover an old lamp shade and use with a base I have. Any ideas. Home Goods have some Christmas items but not the lamp and the lamps “get gone” fast. I haven’t seen that on a handbag, yet, but I’m not surprised since I’ve seen them built into suitcases. I guess on suitcases, you charge it up so when you’re traveling and stuck in an airport, if the charging stations are all busy in the waiting areas, you can charge your phone with your suitcase. I have two portable chargers that I’ve purchased for carrying with me, but I rarely do it since the battery on my phone last such a long time. 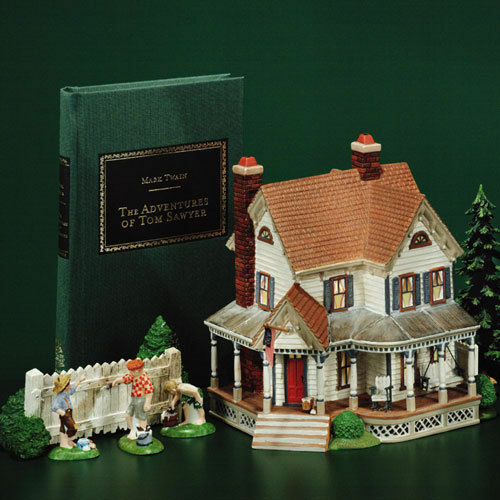 The Aunt Polly house in the Literary Classics Collection is a house belonging to Tom’s aunt in the book, The Adventures of Tom Sawyer. Oh, that would be a beautiful lamp! I would Google “Royal Stewart Plaid Tins” and also search for that on eBay. If none pop up when you search, wait a month or so and try again. I bet the closer it gets to Thanksgiving and Christmas, the more will appear online for sale. 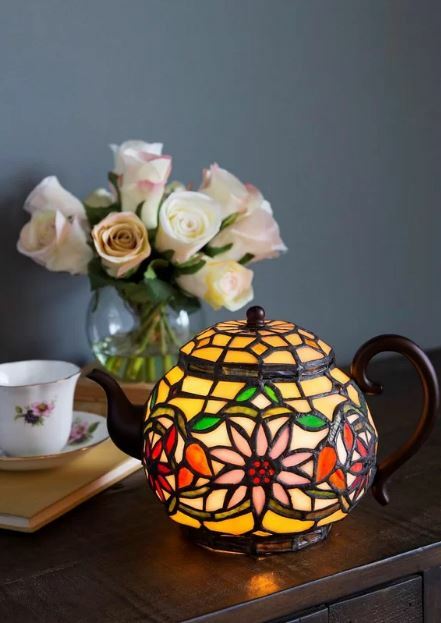 That little teapot lamp is gorgeous! It would look perfect in your guest room that has all the blue décor (it’s available at Amazon, too). My family room also has a lot of blue décor and I’m seriously considering it, but I am always afraid to order fragile things; I hate to do returns. But the price is just right and I also love to decorate with lots of lamps. Now the ad picture of the lamp is following me to all the websites I visit – aaahhhhh!!!! lol The same thing happens to me when I shop for shoes or a purse. Love your idea. It looks like you also get the book with the house. I also liked the blue and white teapot (the second one). 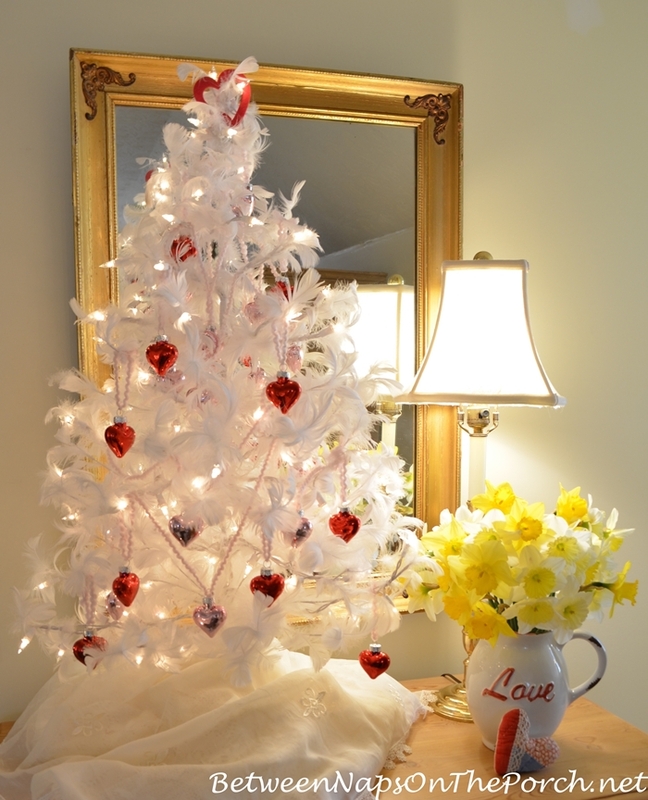 Wouldn’t that look good with your blue and yellow family room? What happened to the lamp from Ireland? I thought that was in the office; maybe the picture just didn’t show up well and it’s still there. I have a few fall decorations out in the yard, but it is still hot even though the leaves are starting to fall. Yup, it’s still in the office, it’s my favorite lamp in this room. Looking at that photo again with the arrows, it doesn’t show up very well, I guess because it’s an off-white color. Also, my pencil caddy is setting right in front of it, partially blocking it from view. In the photo with the arrows, it’s the lamp to the right of the monitors on my desk. I should have taken a photo with all the lights off. They are hard to see with all of them turned on. I just love your blog!!! You have the most interesting things on there. We have a lot of things in common and I look through here to see what else I can drool over. You are a dear lady. Hugs, Marge! I had to order a second one last night. Amazingly the first house I ordered arrived yesterday but the little fence on the house was broken. So it has to be returned. I know that’s the challenge with lighting on bookshelves, finding just the right size lamp. I bet it will be perfect! When we had our first grandchild, I bought a Dept 56 Old Woman Who Lived in a Shoe for a nigh light when the grands would spend the night. I love it. I also have a rooster lamp light you! My favorite! Glad to know someone else who loves lamps! That sounds sooo cute, Molly! Love that! 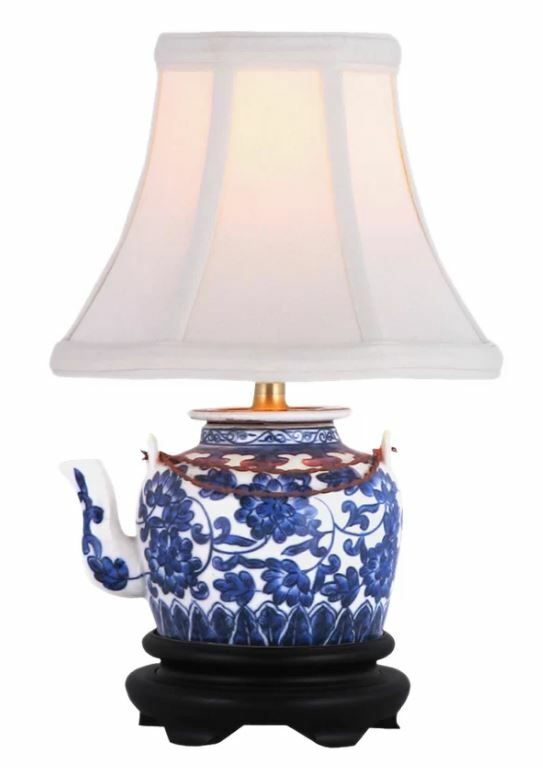 I love that 2nd blue and white teapot lamp, as well as the stained glass one. Unfortunately I already have more lamps than I need. Inherited some beautiful ones from my mother/grandmother and how I wish there was an outlet in the middle of my great room floor! I think the lighted houses will be perfect on your bookshelves, and I look forward to the photos. You can always swap them out withChristmas ones in December, too! I wonder if you could have one added…do you have a basement, Joy? Yes, I do have a basement, with a suspended ceiling! Thank you, I never thought about having an outlet added. Hmmm, will look into that! I did that in my first home. 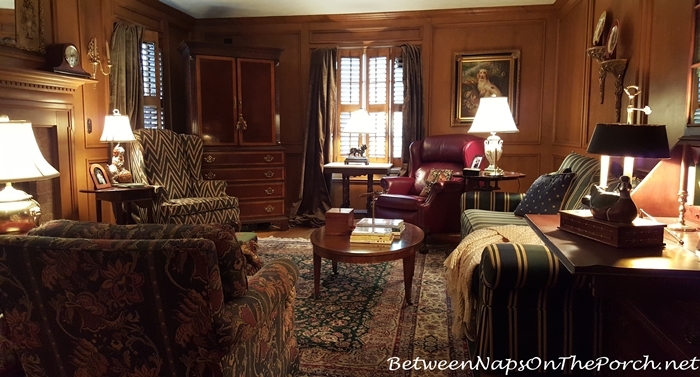 The sofa and love seat were in the center of the room with the sofa facing the fireplace. So the end tables had to be out in the center of the room, too. We had an outlet added to the floor since we knew we would always want that configuration. It worked out great! We didn’t have a basement in that house, just a crawlspace. P.S. : There is also a separate post for ‘How To Make A Shaded Lamp Cordless’ which I did to use as an accent lamp (not task) and worked out quite well. Thanks, Brenda! That is a special light/fixture for me since it was a special order and I had dreamed of buying it for many years before I saved up enough to get it. I knew it would transform that room. It’s amazing how lighting can do that for a room! Have an awesome week, Debbie! Your final choice is so sweet and lovely. MY personal choice was the first blue and white lamp you showed. 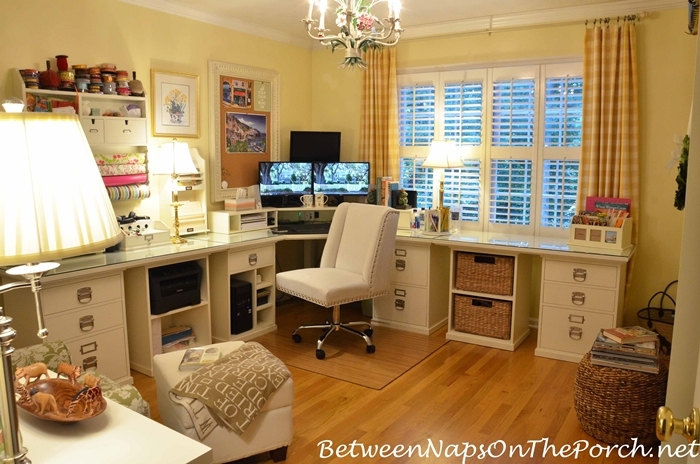 I never like for the “neck” of my lamps or the switch to be visible below the shade. So I would either change the harp on that lamp for a shorter one or I would ditch the harp altogether and buy a light bulb clip to mount the shade on. That would hide the unsightly (to me) metal lamp parts and also shorten the height to make using it possible. I have a wonderful specialty lamp shop less than half a mile from my home and they know me on sight! I love that place! All of these lamps are just adorable. So hard to make a final choice! I think your Dept 56 lamp is ideal for this application so I hope it works for you! Thank you for wonderful ideas, as always! I don’t know if you turn on all the lamps one at a time, or not. I found a remote-control multiple-plug for lamps, etc. at Lowe’s, I think. It has two plugs on one side for “always on” items and 1 plug on the right side for the remote lamps, etc. It is so nice not to have to go around to each lamp. All the ones that would reach the long surge-protector bar that I put into the one plug for “remote” can be turned on with just one tap on the remote that was included. I’m not sure if I explained this well, but just visit the electronics section for plugs, motion detectors, etc. and you will find it. The brand name on the remote is “practecol”. I am a fellow lamp lover named Susan, & I enjoy your blog so much. Thank you!! This lamp is just so cute and the kind of thing I could totally lose myself in. I imagine myself inside, like a dollhouse! I love that you thought outside the box for this. I’m on my way to check out that camera lamp for my son in law, who collects vintage cameras! You’re a treasure trove of good stuff! I kept meaning to ask about the teapot that used to live on your shelf. Did you move her? Susan love the literary house. I have used these small type houses and animals that light up as a night light on my bathroom counter. I change it out for each holiday. I like your idea of adding a small lamp to a bookshelf to help increase both design and functionality. Lately I’ve been wanting to decorate my home in a more classic and elegant style, so I’ve been looking for design ideas online. 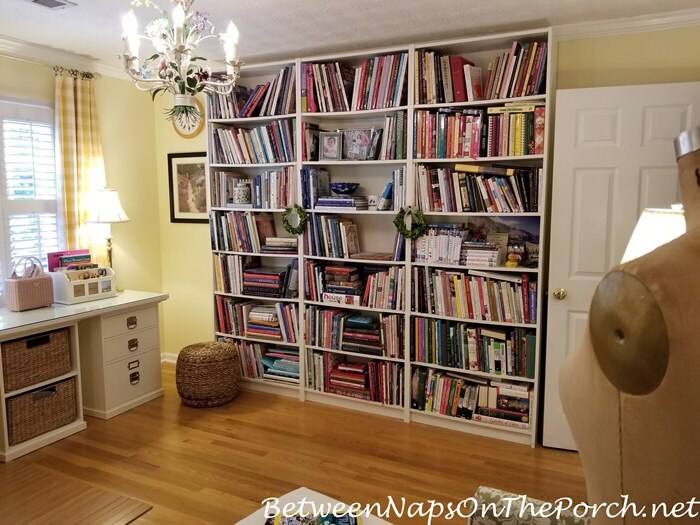 Thanks for sharing this info about decorating bookshelves with lamps!